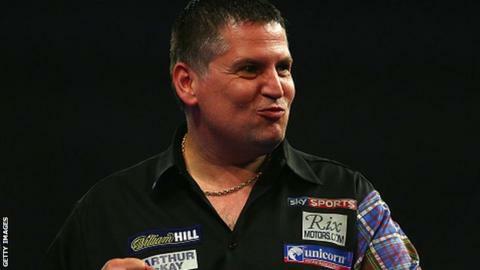 Gary Anderson plays like a darting great but talks like the bloke down the pub struggling to hit his doubles in an inter-boozer league match. In the wake of his victory over Adrian Lewis on Sunday night - a seismic win that brought him back-to-back world titles as well as nestling another £350,000 in his bank account - Anderson preferred self-flagellation than self-praise. He gently mocked himself for his average darts in a flat final and for the "embarrassment" of his faltering eyesight that brought him a few miscounts at the oche and a feeling of wanting the stage to open up and swallow him. Later, he spoke of a creaking body and the sensation of having younger players thundering up to challenge the established order. He said he'd plod on for a while yet, but the sense was that he didn't think he'd be a winner again next year, which is no surprise given that Anderson didn't think he'd be a winner this year or last year. He just gets on with it. That's a favourite phrase of his. He just turns up and plays and sees what happens. If he wins, great. If he doesn't, well, that's fine, too. In last year's final, he beat Phil Taylor in a nerve-shattering contest. The extent of his extravagance after the biggest night of his sporting life was a new regime of one extra shot of coffee in his cappuccino on his way to practice. That was it. The money? He banks it. The trophies? He mostly gives them away. Dust collectors, he calls them. You ask him if the win changed him and he smiles a bewildered smile and turns the question back on the questioner. Why would it? "The day I change, slap me," he says. You ask if being world champion changed anything and he replies that he still doesn't think of himself as world champ. It's a mantra he will probably stick to even though he has now won back-to-back titles. It's his way and it's part of his appeal. It's not false modesty. It's just a genuine aversion to fuss and bother. He almost has an allergic reaction when reminded of the great things he has achieved. "I'm just a darts player," he says. "I'm not a rock star." Maybe that lovely self-awareness is part of his success. Maybe it's a big part. He travelled to London's Alexandra Palace more in hope than expectation. He was low-key, as ever. He, like everybody else, thought that Michael van Gerwen was the roaring hot favourite and he could not see much beyond the Dutchman. It wasn't that he played down his own chances, he just didn't play them up. There is no hype or hoopla with Anderson. No hubris, no fighting talk. He's so unaffected by success he comes across as a guy who gate-crashed the World Championship and got lucky. The truth is that, when he hits his stride, he is a machine. He can win in different ways. His semi-final victory over Jelle Klaasen was one of the finest in the history of the World Championship. Some of his scoring that night even had one of the game's greatest players and pre-eminent yappers, Eric Bristow, stuck for words. The final against Lewis on Sunday was altogether different. It was a grind - and Anderson found a way of doing it a little bit better than Lewis. It's unusual for a final to be won with a lower scoring average than your opponent, but that's what Anderson did against Lewis. He did it against Taylor last year as well. In the first of his three finals, in 2011 against Lewis, he had a higher scoring average - and lost. It's back-to-front, but the Scot defies convention. And he'll be back next year, ignoring all talk of him going for three in a row, a feat that only Bristow and Taylor have achieved. He might have new eyes by then. Anderson is having his vision checked as soon as possible. He won't wear contact lenses - he's squeamish. And glasses aren't his thing either - he says he knocks them off when he throws. In the past he has resisted the temptation to have laser surgery. It's a procedure he might reconsider now. He will no doubt say that his improved vision will only make the threat of the younger ones more vivid and there is truth in that. But only to a point. Van Gerwen is only 26 to Anderson's 45 and represents the present and future of world darts. Lewis is only 30 and has more titles left in him. James Wade, the world number six, is 32. Michael Smith, the world number eight, is 25. The fact is, though, that all those guys, plus the storied champions like Taylor and Raymond van Barneveld, and the two other Scots in the world's top 10, Peter Wright and Robert Thornton, are all looking at Anderson as the one to beat. Nobody has managed it on the biggest stage of all for two years now. Twelve straight victories - 58-22 in sets - and two world titles. Van Gerwen might be the 'boy wonder', but Anderson remains The Man.